I strongly support the need to reduce gun violence in our country. 88 Americans are killed every day from gun violence. I talk to friends and family about this topic a lot, and I know who shares this belief and who does not. And in the past, I've been really reluctant to talk about this with people who I know disagree with me. 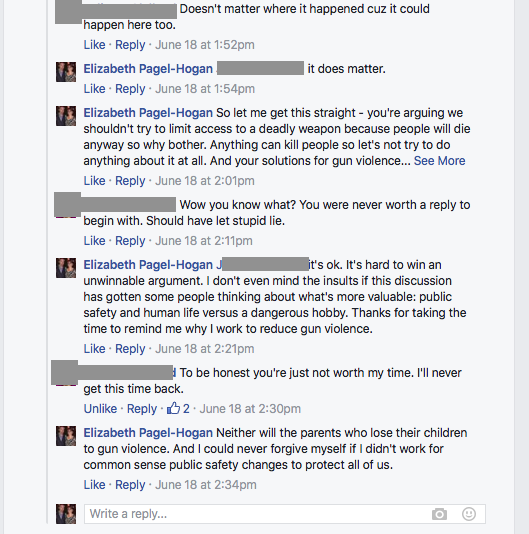 I didn't want to get in an argument, and I know how hard it is to get people to change their opinions. I'm not a hypocrite. I don't have an open mind about this topic. 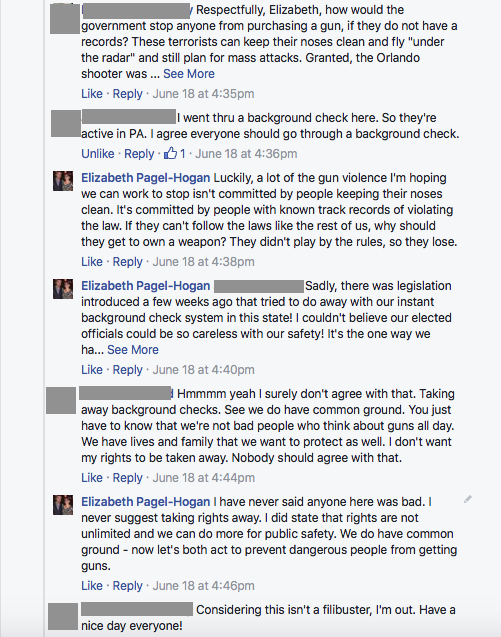 I freely admit I wouldn't go into a conversation with a gun enthusiast and consider the possibility that there is nothing to be done about gun violence, or that limitless gun ownership would ever be a good thing. But a few days, I tossed some caution to the wind (why?) 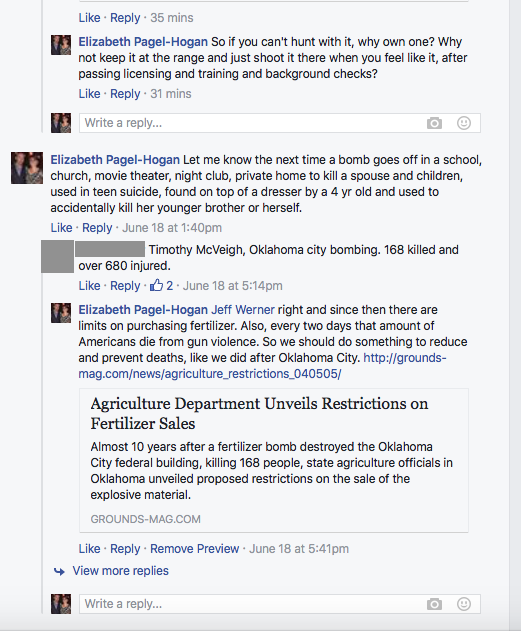 and decided to engage some gun enthusiasts. I admit I did not start out with a super polite and friendly approach. Sorry. I was mad. 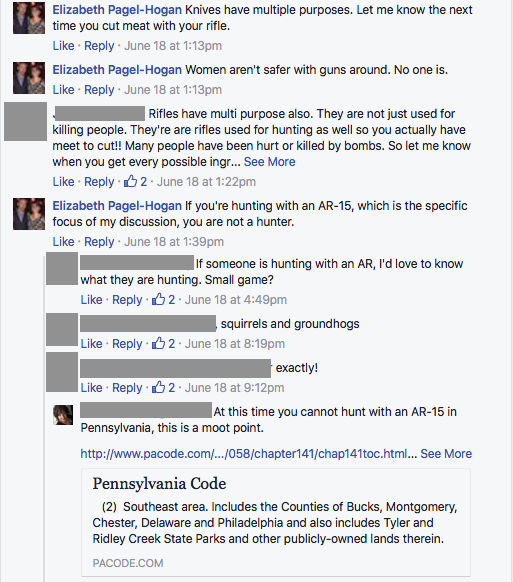 The context: there's a club in the Pittsburgh area designed to encourage women to own and shoot guns and support their businesses. It's called Pistols and Pink because women like pink (?). I went once and shot a target with a handgun. 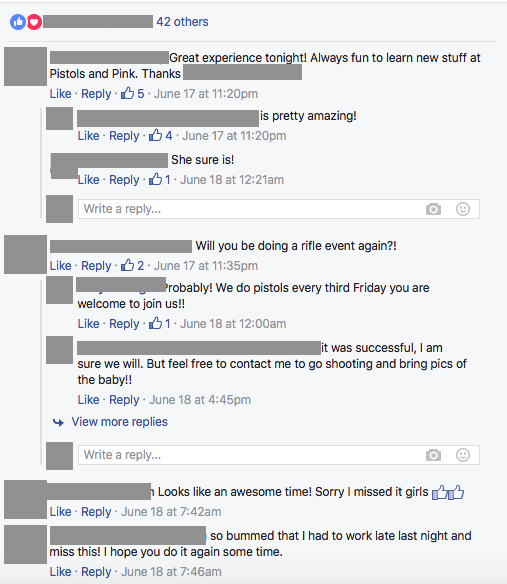 But on a Friday in June they had a rifle night, less than a week after the shooting in Orlando. It just felt so insensitive to me. So as you read, you can see my comments. 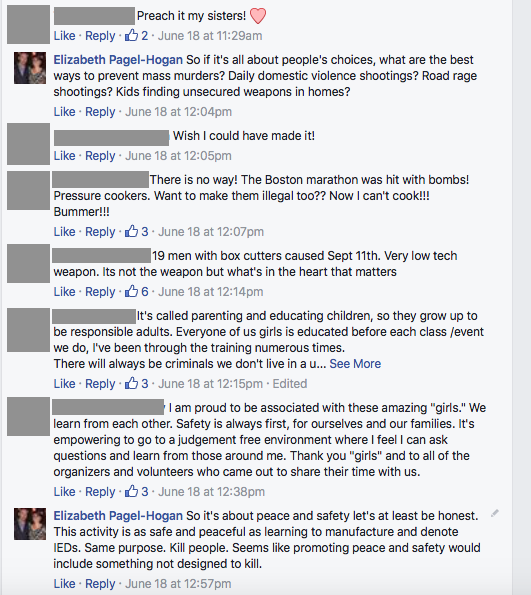 Yes, I inserted some sexual politics into my gun violence tirade because they are connected. 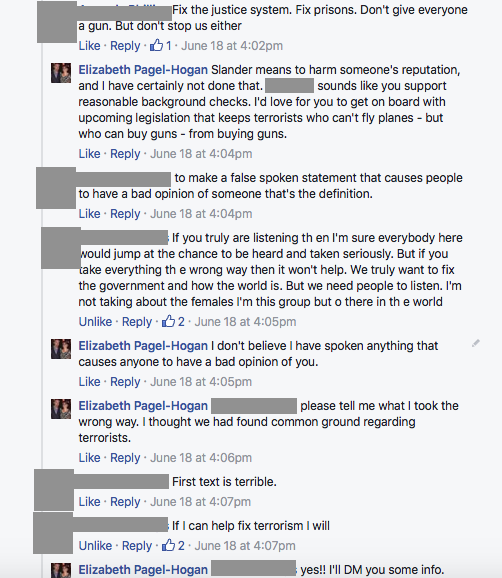 Also, I tried to blur out everyone else's faces and names. Please let me know if you catch one I missed. It's going to be hard to read sometimes because there are comments from several different people. 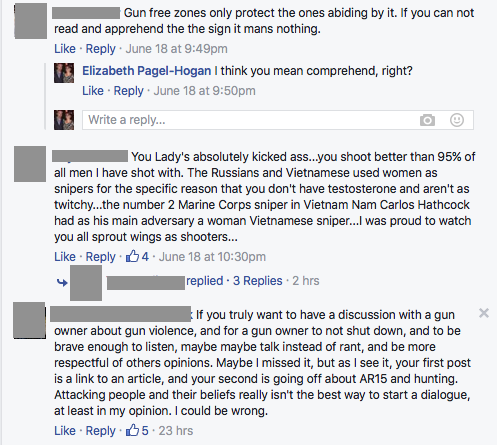 This section includes classic "everything is a weapon" arguments. 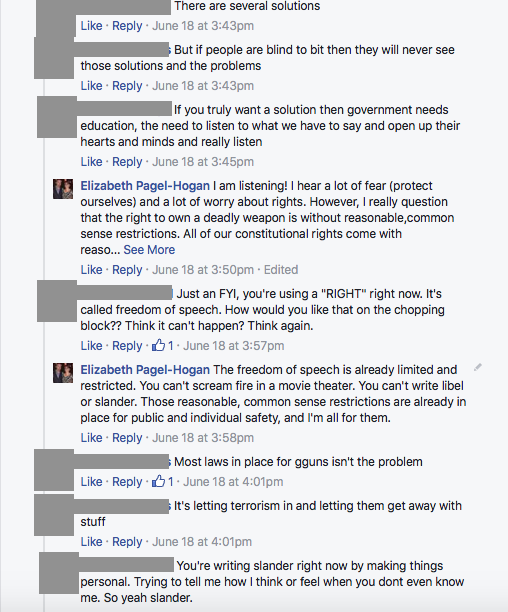 Here's a section of comments where I get called 'part of the problem.' I don't think our country is perfect, in fact I think there are a lot of problems. I'm not sure which problem this commenter is referring to, and I was reluctant to ask because this commenter was very aggressive. I should note this commenter was male. 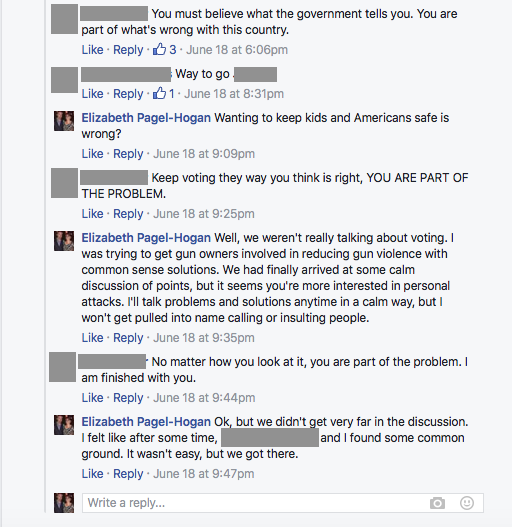 Back to sexual politics: both male and female commenters engaged me, but the female ones did eventually make some effort to compromise. One of the first times I'm called "stupid." 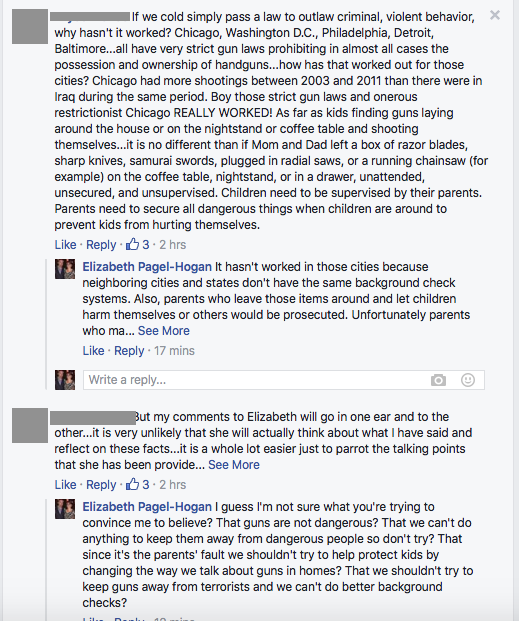 Here the argument diverges from gun violence to education, respect, parenting, etc. And the appearance of the "bad guys don't follow laws so don't make them" approach. Also appears in tandem with the "we need to protect ourselves" approach. And a quick detour to a critique of the justice system. Honestly, I really got the sense these people are living in constant fear and paranoia that they are going to be attacked any minute and need weapons on call 24/7. I couldn't imagine living like that. That seems like a serious problem that needs to be addressed. 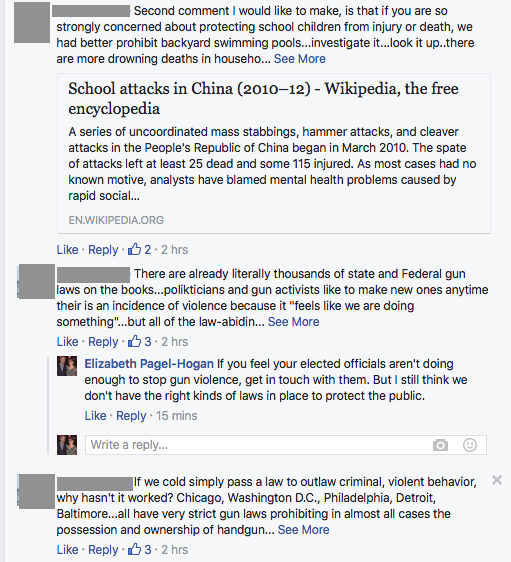 So above I brought up that other constitutional rights are limited, and then I get accused of slander. I'm not a lawyer (but some of my friends are) but I'm pretty sure I didn't slander anyone. 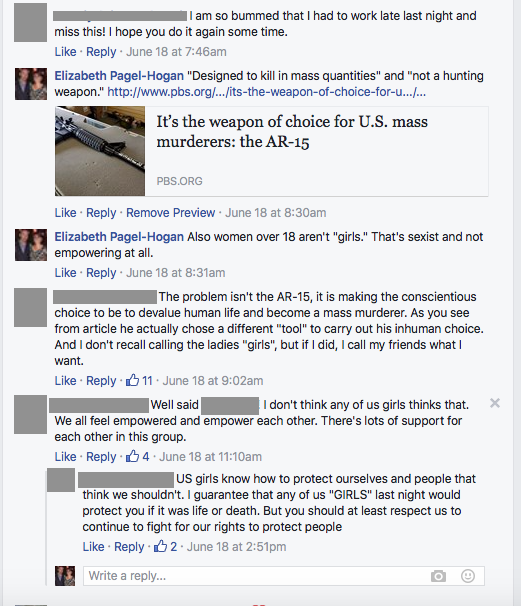 I am pretty sure I hurt their feelings and offended and insulted them (see the comment re: girls). But they called stupid. Are we even? 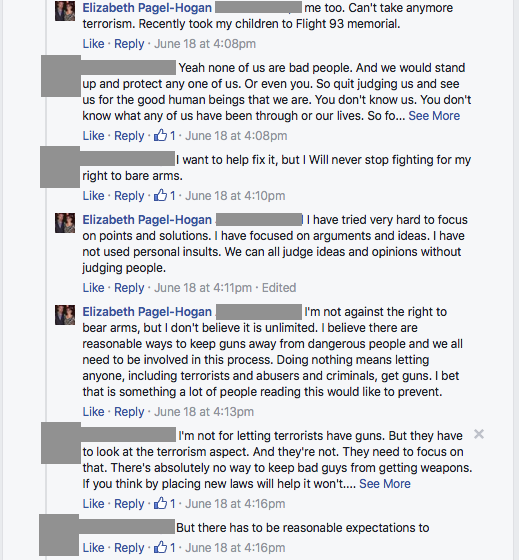 So I thought here we had reached some common ground on preventing dangerous people like terrorists from buying guns. 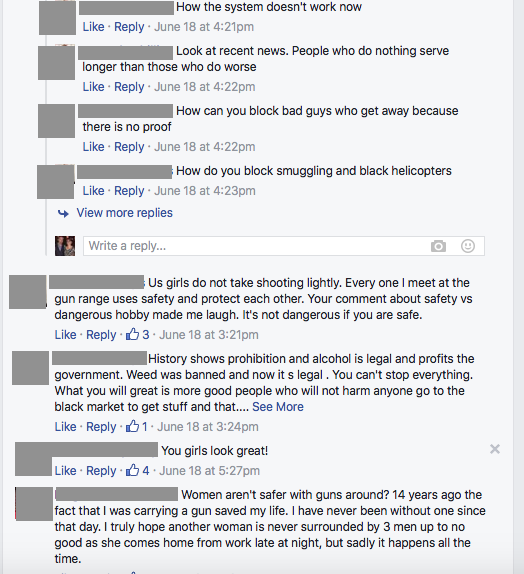 But read on for "black helicopters." 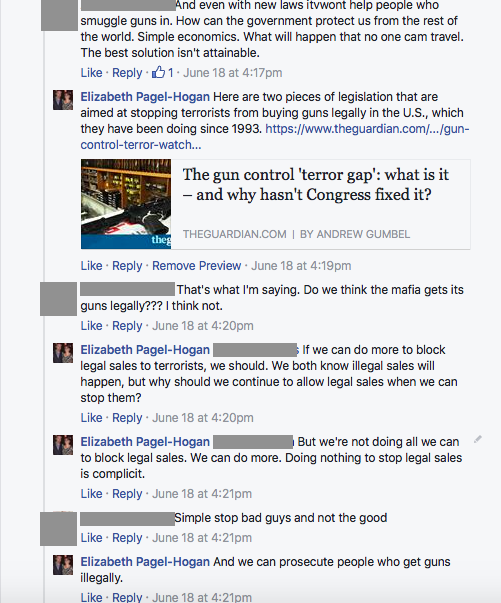 I thought we had enough problems trying to make sure legal gun sales had background checks. I wasn't scanning the skies for black helicopters. I feel bad for this lady above who was threatened and I'm glad she's safe. But the statistics just don't bear out that having guns in the home make women safer. Or children. Her situation is the exception to the rule, the anecdote that you remember because it is so wildly different from the overwhelming majority of interactions with guns. In the next photo, I'm asked why I'm even on this post. There's the Chicago argument again. And I'm the one accused of spouting talking points? Really??? And more commentary on bad parenting. I'm trying to keep my kids safe. 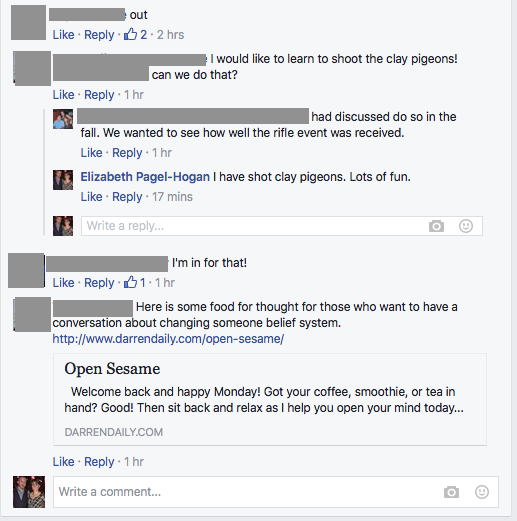 I have shot clay pigeons. It was fun. 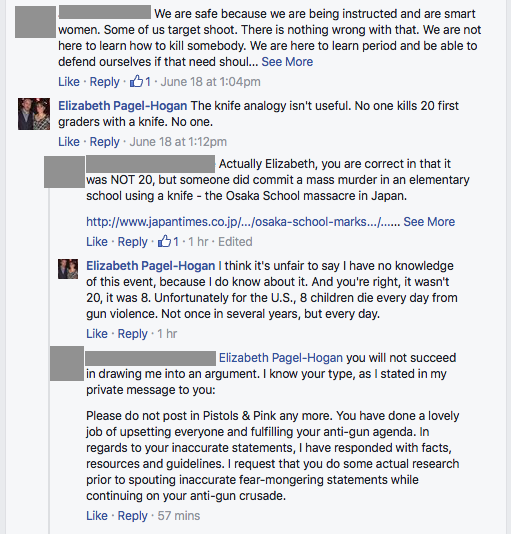 The discussion has continued to today, and someone took the time to bring up when 8 children were killed by a knife in Japan. That was terrible. It also gave me the chance to point out that 8 children are killed EVERY DAY in the U.S. by gun violence. And I was asked to leave the post. But LOOK AT THIS. 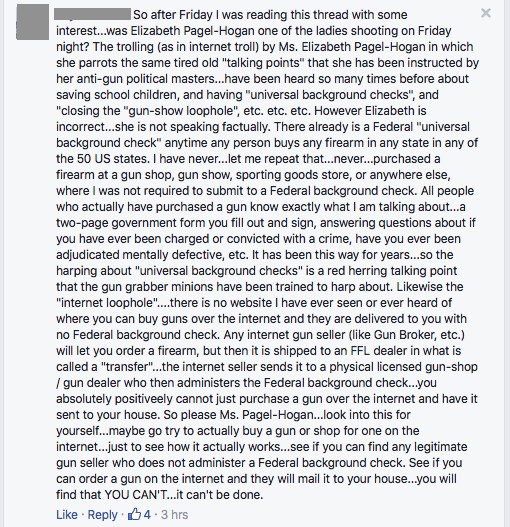 Yesterday, a person who earlier called me stupid and didn't have time for my idiotic comments agrees we need background checks. This was like a sun beaming through on a winter's day. Ok, I'm sharing this one because I need to confess that there seemed to be a real lack of strong writing skills by many of the people commenting against my POV. 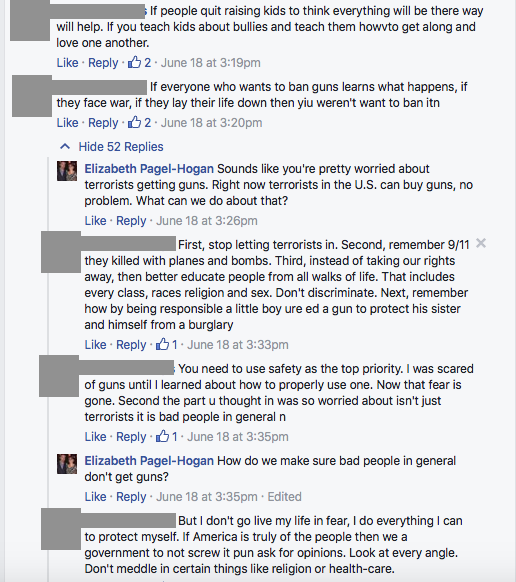 I'm not trying to generalize, but some of the comments were really hard to read and decipher. There were a lot of errors. 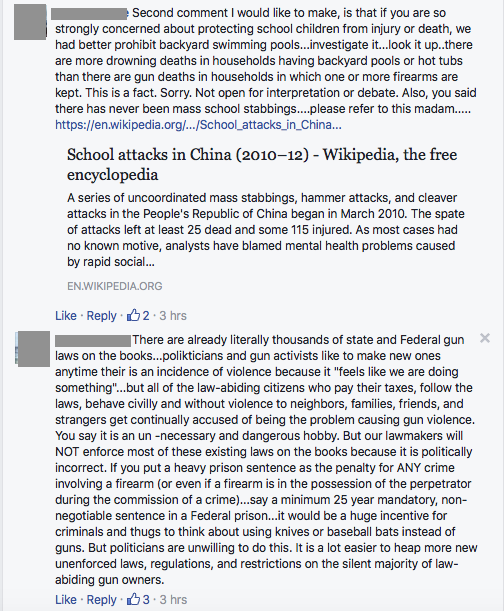 I can't say that there is a correlation between a problem reading/writing and being a gun extremist, but maybe there is a connection between the fear aspect that underlies this intense need for protection and a struggle to operate in our society that really demands literacy to succeed. 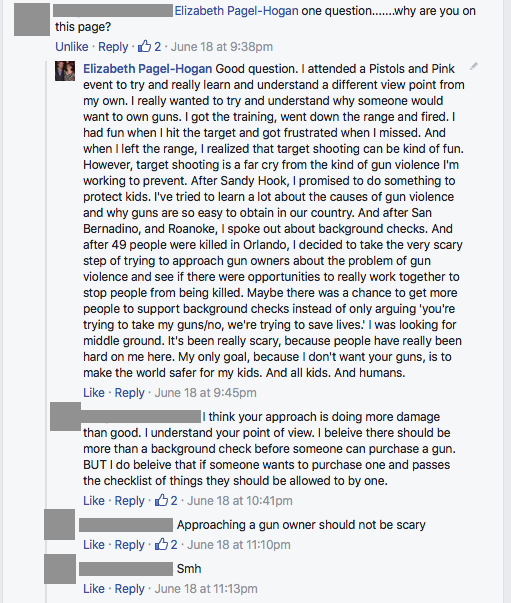 Here's a classic comment about how we should switch focus from guns to other dangers. I haven't responded, but I think a good response is: we should care about all of these things. We don't have to pick one and ignore others. People like to make this argument about cars, too. 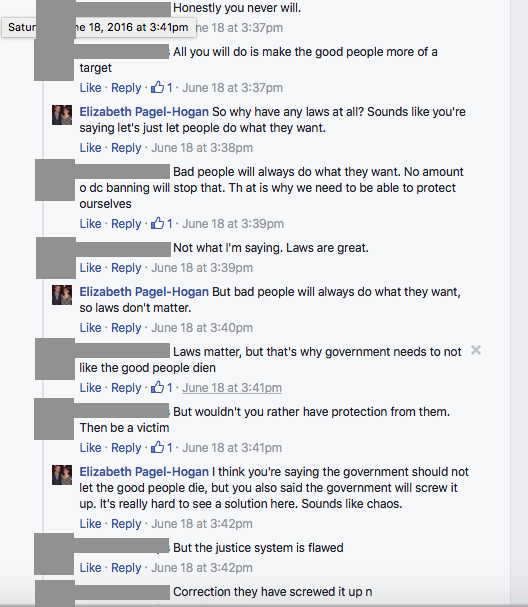 I'm intrigued by the common thread in these posts about the government not enforcing the laws enough. What kind of answer would satisfy that opinion for these people? What kind of resolution embodies "better enforcement" to them? Ok, so there are some snippets and screenshots of the debate. Was it worth it? Probably not. Maybe. I don't know. I still feel nervous every time I get a Facebook notification, that there's going to be some kind of threat sent to me. But I feel nervous putting my kids on the school bus or going to the movie theaters, too. What if there's a shooter there? 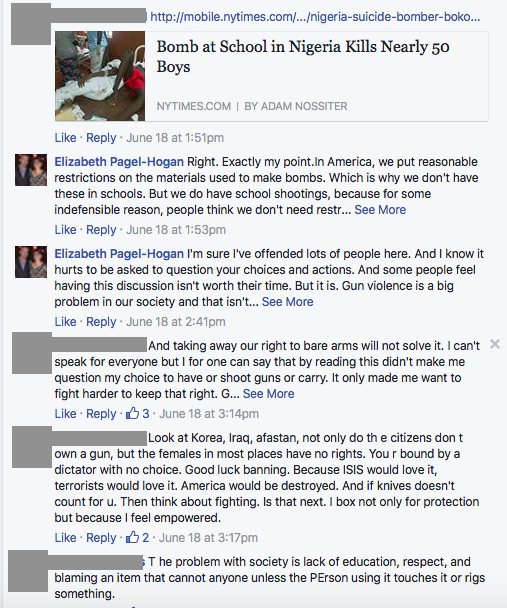 What if I didn't try and do anything to make us safer and a shooting happened in my community? What if I did nothing? That scares me even more. 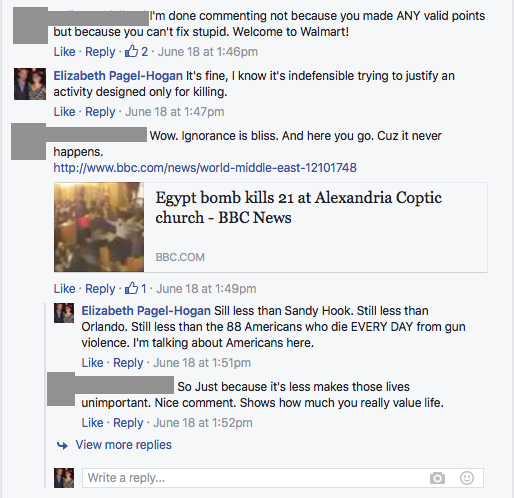 Facebook debates can be pretty useless. But you can take meaningful action here.